I tried to start a Pints & Purls session at my local tasting room, Rocky Mountain Brewery. 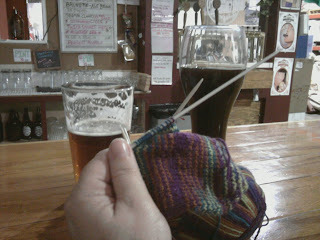 For a while, my friend S. came with me to drink, even if she didn’t knit (although she does know how). But then women’s football season got into full swing, and she became busy with her practices. So for a few weeks, it was just me. I didn’t really mind. I could bring my dog, and more importantly, they had great beer. In fact, Rocky Mountain Brewery just won the Silver and the Gold medal in the Fruit Beer category at the 2012 World Beer Cup with their Da Yoopers Cherry Ale and Eat a Peach Ale. They make a delicious American amber called the Redhead (I’m partial to it), and right now they have a Strawberry Cyder on tap that’s like spring in a glass. If you’re looking for a good craft brewery on the East side of COS, check out RMB. They allow dogs (because they don’t serve food, although there is a BBQ truck outside on the patio), and there’s hooks on the underside of the bar to hang a purse (it’s the details that count!). It isn’t pretty, but the bathrooms are nice (women care about this), the beer is GREAT, and everyone is friendly. 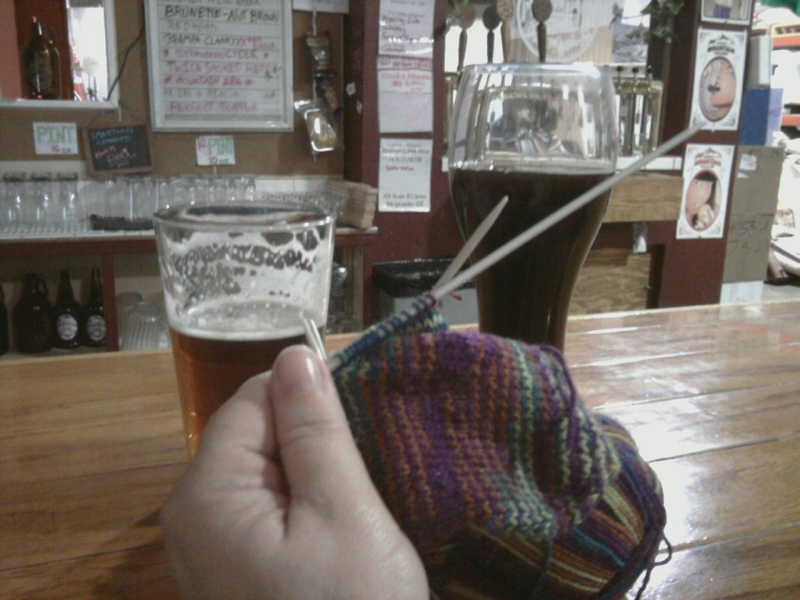 Well, the beer is good, but the knitting is not so great. I decided to make socks as my “drunken knitting” project. Did I mention these are my first socks? Ever? I chose the DVD socks pattern because it seemed straightforward and easy. I started the toe at home, with nothing to distract me, then whipped it out my next time at RMB. I got a few funny looks, some interest, but mostly I was just humored. My friend Char came last week (she’s working on socks too), but won’t be able to make it regularly. I posted on the LSG (Lazy, Stupid and Godless) COS group on Ravelry (hoping to meet some younger knitters), but not much interest there either. Some of them already meet every other Thursday at a bar downtown. It’s a 30 minutes drive and I was really hoping to find a group who met closer to my home. So for now, it’s just me, my sock, and a good beer. Wanna join me?